Clouds roll in behind the Cinderella Castle at Magic Kingdom, part of the Walt Disney World theme park and resort in Lake Buena Vista, Florida, on Oct. 5, 2016. 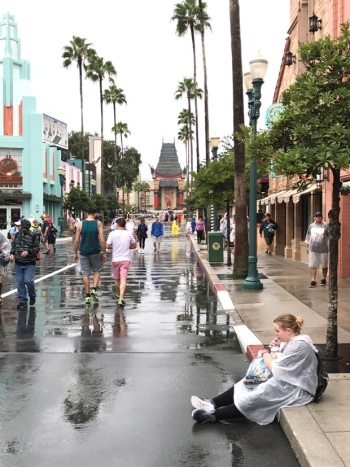 Orlando-area theme parks began to close Sunday as Hurricane Matthew churned toward the U.S.
Florida's theme parks remained closed on Friday as wind and rain from Hurricane Matthew lashed the Atlantic coast and thousands were left without power. Walt Disney World, Universal Orlando, the Kennedy Space Center Visitor Complex and SeaWorld are among the visitor attractions that have shut down. Matthew was downgraded to a Category 3 storm overnight but officials warned it could still be dangerous as it moved up the East Coast, threatening hundreds of miles of coastline in Florida, Georgia and South Carolina. At the food court at Disney's Art of Animation attraction, where the wait for pizza was more than an hour and half about 5 p.m. Thursday, Stephanie Bautista was stocking up on fruit for her family. 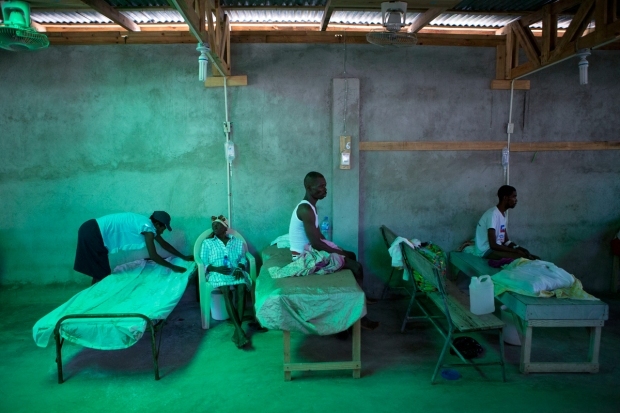 "They said they're going to close this whole place down and keep us in," Bautista said. By 6:45 p.m., the line for food would stretch outside. 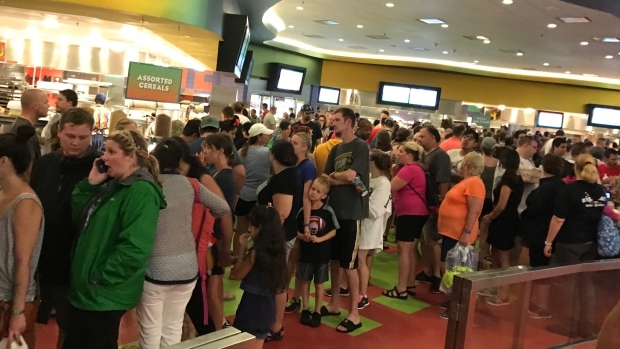 Visitors to the Walt Disney World Resort in Orlando, Florida, line up for food as Hurricane Matthew bore down. Bautista's flight back home to Houston on Friday was canceled so she booked an extra room. But because she has been through hurricanes before, she said she "wasn't too worried." Walt Disney World's theme parks, water parks, Disney Springs, miniature golf courses and ESPN Wide World of Sports complex are all shut. Mickey's Not-So-Scary Halloween Party was cancelled for Friday night. Guests at the Walt Disney World Resort hotel were warned by voice mail to stay in their rooms through Friday. Two visitors from England who had been in Florida all week had gotten some extra candles and water Thursday evening but did not know what to expect. Lucy Cotton and Lucy Best, out at the "Crossroads of the World" section of Disney's Hollywood Studios, were part of a group of six. They said the rental villa where they were staying told them to fill up their bathtub with water to use for sanitation. 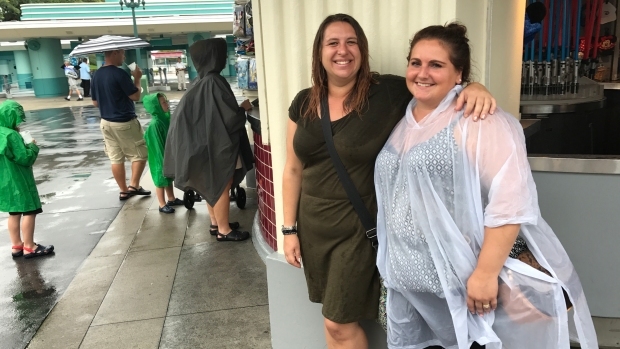 Lucy Cotton, left, and Lucy Best, right, prepare for Hurricane Matthew at the Walt Disney World Resort in Orlando, Florida. The visitors from England bought extra candles and water and had been told to fill up the bathtub at their rented villa. "Try not to worry too much," Lucy Cotton said. At Universal Orlando, Wet 'n Wild, Universal Studios Florida, Islands of Adventure and CityWalk also are all closed and Halloween Horror Night is cancelled for Friday. Plans are to resume normal operations on Saturday morning. The Kennedy Space Center Visitor Complex in Titusville will remain closed until Saturday, when it expects to open at 9 a.m, while SeaWorld Orlando's website says it will reopen at 10 a.m. Saturday. Disney, Universal and SeaWorld allow tourists to cancel or reschedule trips in the event of a hurricane warning, though policies vary for each theme park. Universal Orlando and Disney World waive fees for rescheduled vacations and cancellations within seven days of a hurricane warning in Orlando or a visitor's hometown. In the case of a named storm, Universal says it will also refund vacations that were booked through a third party. Disney's policy only applies to reservations made directly with the company. Officials in Florida, Georgia and South Carolina had urged people in evacuation zones to leave. Matthew has already left more than 280 dead in its wake across the Caribbean. One death was reported in Florida. The Orlando Sentinel said Florida's three theme parks closed for the first time in their histories in 1999 as Hurricane Floyd approached. The storm eventually changed course. In 2004, the parks closed for three hurricanes — Charley, Frances and Jeanne. Disney and Universal also closed briefly during Wilma in 2005. 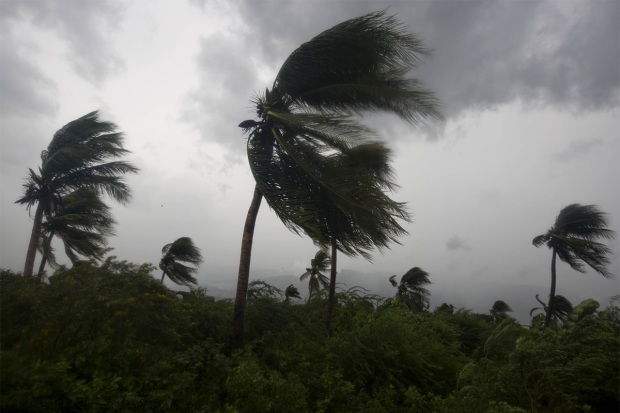 Footage of the gale-force winds in Les Cayes, Haiti.